Depending on how you listen to your music, you may want—or need—to adjust the sound that comes out of your computer or your iPod. If you have simple speakers connected to your computer, or use an iMac’s internal speakers, you might not have bass and treble adjustments available. Yet for some music, you may want to change the overall sound by increasing or decreasing certain frequencies. Equalization is changing the volume of certain frequencies to change the sound of music during playback. iTunes includes a graphic equalizer that lets you change the volume of 10 different bands to alter your music, and, in many cases, improve the sound. To access the iTunes equalizer, press Command-Option-2, or choose Window: Equalizer. If you’re familiar with the way an equalizer works, you’ll see that the display of the Equalizer window is pretty much the same as a standalone graphic equalizer. It has sliders that let you adjust the volume of each of its 10 bands; just drag them up or down. 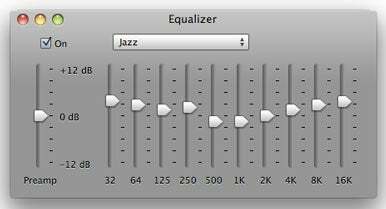 However, many people don’t know how to apply equalization—for this reason, the iTunes Equalizer has two dozen presets, including Classical, Jazz, Rock, Bass Booster, Bass Reducer, Treble Booster, and Treble Reducer. If you check the On button and choose one of those presets, your sound output will change according to the frequency adjustments the preset contains. Using an equalizer is a bit of voodoo; in most cases, the “genre” presets won’t work with all the music of that genre, since every recording is different. You will find that, say, Rock will make some rock music sound better, because it enhances the bass and treble, and that the Dance setting, which enhances bass, might make dance music sound better. But in other cases, the music may sound muddy or tinny. Equalization is more designed to compensate for your environment (your room) and your playback equipment (your speakers). For example, if you find that you get poor bass response, either because your speakers aren’t bassy enough, or your room dampens the bass, try using the Bass Booster preset. Or if you’re using small speakers—such as an iMac’s internal speakers—the Small Speakers preset might improve your sound. You can either use the equalizer for all your music, or apply presets to specific songs or albums: to do the latter, select a song, press Command-I, click on the Options tab, then choose an Equalizer Preset. iPods have equalization as well, using the same presets as iTunes (Settings: Playback: EQ, or—on an iPhone or iPod touch—Settings: Music: EQ.) Here, you might be more tempted to use equalization to compensate for weaknesses in your earbuds or headphones: one of the most common uses is to increase bass, since many earbuds are wimpy at the low end. If you apply equalization to specific songs or albums using iTunes, that setting will override any global setting you’ve chosen in iTunes or on your iPod. No matter how you use equalization, you need to try out different settings and see how they sound. You may notice distortion with some presets; I’ve found that some piano music distorts at high-volume sections when treble frequencies are raised, for example. You might also like to roll your own equalizer presets—in iTunes, just move the sliders to where you want then, from the preset menu, choose Make Preset and save your preset. But when you do so, you can only use your preset on your computer; custom presets don’t get carried over to the iPod, nor do they get saved with your songs. They also don’t get transferred with your music to another computer, but if you want to duplicate your presets, you can copy your iTunes EQ preference (your user folder/Library/Preferences/com.apple.iTunes.eq.plist) from one Mac to another. 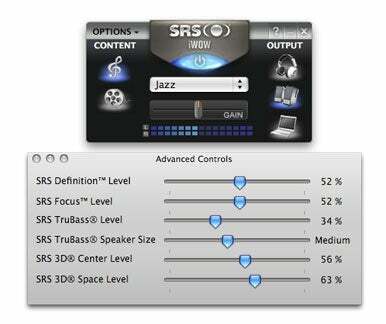 SRS Labs' iWow Premium plug-in for iTunes. It's not clear exactly how this plug-in works, but when you try it out, you’ll immediately hear the difference. Sound becomes richer and more spacious, with most speakers or headphones. Some of my colleagues have said they simply can’t listen to music without it any more, but other people find the sound too artificial. If you have to make do with the speakers or headphones you already have, it’s worth trying out iWow’s 14-day trial download to see what it does for your music.